ranger is a beautifully designed console based file browser to boost your productivity. ranger shows the current and parent directories in multiple columns (panes), presenting a complete context of your current location. And don’t be scared by the project tagline mentioning vim, ranger supports very easy navigation using arrow keys. Of course, having vim-like keybinds makes it a perfect companion for vim users. But that’s just the tip of the iceberg. ranger supports a lot of customization and the power to open every file type with the default desktop application you have assigned to the mime. Then there’s distinct highlighting for different mime types. So it’s as good as Nautilus sans the bulk and you can navigate and work much faster. ranger is much more evolved than NcursesFM we visited earlier. and check the sections CONCEPTS and KEY BINDINGS. 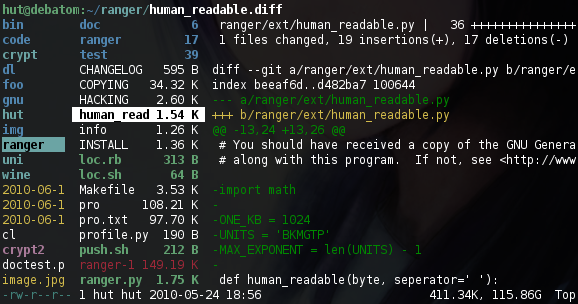 Config files are in ~/.config/ranger/ which you can run through once. has xdg-open, flag f = xdg-open "$1"
ext mkv = smplayer "$@"
And that’s just the beginning. There’s a lot more you can do with ranger.